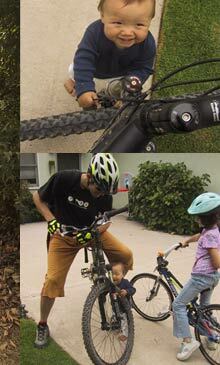 Saturday Oct 1st was a day of firsts for Jaelin and Katya, their first mountain biking experience! 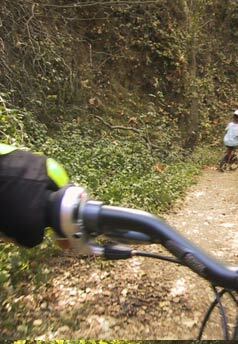 We rode to celebrate IMBA (International Mountain Biking Association) annual take your kid mountain biking day. 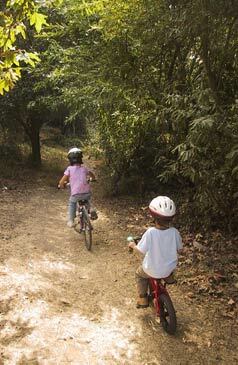 Jaelen at 4 has got to be the youngest mountain biker I know, and Katya was hard to keep up with! We had to drive the biodiesel vehicle a few miles to the trails because unfortunately there's not much singletrack within riding distance of the house… Although we did ride along the wonderful boardwalk bike trail in the morning to a stint on the beach playground. 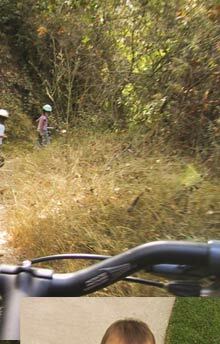 When we arrived, we unloaded, found the first trail that led downhill and took it! We cruised along the creek a ways, under a tree branch to a little bridge where if we were quiet we could hear the water whispering to us. Refueled on lunch and an apple they were ready to head back uphill! Jaelin and Katya discovered speed bump airtime while hanging around the parking lot as I was loading up the bike, I think we are all looking forward to Take your kid mountain biking day next year.